A family story. Founded in 1929 by a husband and wife team of pharmacists, Mayoly Spindler was bought in 1975 by Dr Jean Marie Vernin. From 1975 to 1982, with the launch of Charlieu shampoos and the handover of the company by Jean-Marie Vernin to his son Jean-Gilles Vernin. From 1982 to 2008, with the acquisition of Laboratoires Galéniques Vernin, Rosa-Phytopharma and Opocalcium and in 1994 the launch of the Topicrem range, quickly followed by the acquisitions and launches of the products Helikit, Eurobiol, Colchicine and Colchimax. From 2008 to today, with the handover of the company from Jean-Gilles Vernin to his son Jean-Nicolas Vernin and the product launches of Colokit, Cholurso, Mikicort and Probiolog Strong, and the acquisition of the dermatological product line of Laboratoires Thea. Recent events also include additions to the Topicrem line and OTC product launches. 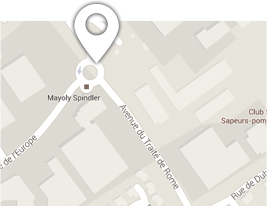 Mayoly Spindler is still an entirely family-owned, French independent laboratory.